All my customers are surprised about the beauty and quality of the item in their hands; what happen is, it is very difficult to capture a real good picture from a sparkling emerald, gold, and diamonds piece because the light’s reflection blinds the camera lens. I have been anxiously awaiting the arrival of the ring and this morning it arrived. I was somewhat apprehensive about the size of the emerald and that the ring would look better in person. I LOVE IT!!!!!!!!!!!!!! the emerald is actually the perfect size and I love the color. Please tell your husband that I forbid him (lol) from creating another one like it....I want the only one! Thank you so much for the beautiful necklace pendant, bracelet and earrings! My wife was very surprised and very very pleased with the beautiful emerald jewelry. My jeweler here remarked on the beautiful color and clarity of these beautiful stones. The earrings that Norberto made to match the necklace pendant are spectacular, perfect custom made complement to the pendant. The bracelet is so simple and beautiful and goes so well with the pendant and earrings! It was a very exciting and joyous moment to be able to present my wife with these gorgeous pieces. I have received my emerald and I am very happy with it and all the documentation. I am so grateful to you for this. My best wishes and regards to you and your family. Hi! The emerald ring is Beautiful! Wow! You were so right, it is even more beautiful in person. My mother is going to love it! It is the exact medium green I was looking for with the clarity that I was looking for. The diamonds sparkle and are of great quality. The style of the ring is just lovely. It is so lively. It puts my emerald to shame and I got it from an emerald company that gets their emeralds direct from Columbia. Please if you across the same green with the same clarity again. I want one too. LOL. .
You can use this letter as a testimonial. Your service was fast. Thank you very much for the really lovely Emerald and diamond ring. Although I picked it out, it was a present for my birthday on Jan. 6th. My appraiser, Mr. C. Roger Barnes, appraised the ring at $ 4300. and said it was a very pleasing emerald. 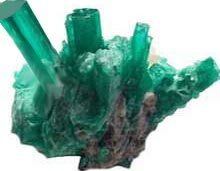 Many years ago, he and his partner used to go to the emerald mines in Colombia each year and import emeralds. At first I wasn't sure as to weather I should buy from you but because you were Pay Pal verified I figured it was ok. I received the Earrings and I must say they are beautiful and I would not have a problem buying again. The necklace I wanted to get from you had already been sold! "darn it" Should I see it again on your web site I will buy it, I believe you sell a great product at a good price. I just received this necklace in the mail and I am very pleased with it. The quality of the gemstone was exactly what I expected. I think you did an excellent job in shipping and getting it to me very quick. It is a birthday present for my wife. I received the necklace tody and all I can say is WOW! That emerald necklace is gorgeous! It is the perfect size, not so big and gaudy that everyone thinks it's fake and not so small that it doesn't grab your attention. The color, sparkle and size, my wife is going to love this necklace. I searched and contacted many places on the web before I found Emeralds and Jewelry and I am so glad I did. The service, the gems, everything was first class and I will definitely be back again. I was very pleased with the ring. It was a big hit with my wife as well! It arrived on time. But it did require a signature so I had to pick it up at the post office. No worries I understand why you require it. The ring was just as the picture showed it. I just want to say that the emerald pendant is just stunning. I wear it on a choker necklace and receive compliments all the time. It's such a beautiful green. Thank you. I am very happy with the emerald and diamond ring I purchased from you. It is beautiful: the stones are brillant, and even jewelers have complimented their quality. Your service was impeccable, polite, friendly and prompt. I am so pleased that I found you! The ring is beautiful! My wife was thrilled to terms when she laid eyes on the ring. The stone is beautiful and the quality is great on the side set Diamonds. I would not hesitate to do business with your wife and you again. While we did all this online and it worked perfectly, we would love to come by your shop on our next trip to Miami! I've received my second ring from you and I'm as pleased if not more so than I was with the first one. The design, craftsmanship and materials are again top notch. Thank you for helping my wife surprise me with it. I'll wear it proudly and continue to recommend your company to all who ask me about it. My wife was thrilled with the rings. They are a replacement for the original engagement and wedding ring when we married 20 years ago. The original (and much less expensive) set was lost somewhere in our rear yard while building our house here. After viewing your website, I asked her if she would accept this pair as a replacement 10 years later as a 20th anniversary present. I was very pleased with both the color of the stones and the sturdiness of their attachments. The only wish I would have, would be that the set had come in size 7 as the ring is now at a local jeweler for sizing. She will have it for our anniversary in June. We were both impressed with the cost and value of the rings. She couldn't wait. She already has taken the ring to a trusted local jeweler for sizing. Thank you for the offer however. I think she will be happy when he finishes. As I said, it's been 9 years since the original set was lost. I believe she felt it would never be replaced. I'm glad myself, that she was pleased with the set. Viewing the stones through my loupe, I am well satisfied with the value for the price. I will happily recommend you, should others comment on the set. I just want to said " Thank you" for helping me out for the anniversary gift. The ring is awsome. Since it so pretty, I gave it to my wife " early"!! She loves it. Again thank you.